First Ergonomic Glide-able Mouse Pad! We are very excited to introduce you to MouseGlider™, a product that will dramatically change how you use your computer mouse. 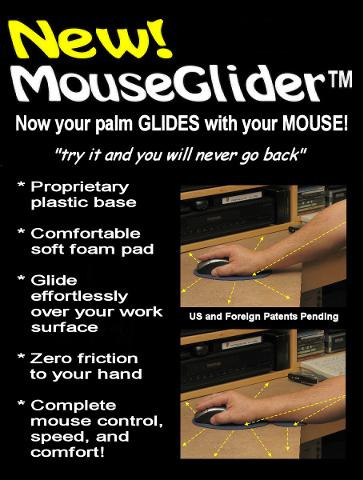 The MouseGlider™ (Patent No. : US 7,997,544 B2) is the world's first and best ergonomic glide-able mouse pad unique in the industry and is the ultimate ergonomic accessory for your mouse, and once you try it you will not want to use your mouse without it. Leonardo da Vinci once said "Simplicity is the ultimate sophistication" The MouseGlider™ ergonomic mouse pad is a perfect example. Detailed design and high quality material make the MouseGlider™ the ultimate best mouse-pad accessory that is simple to use with any mouse. See the reviews link. What are the benefits of the MouseGlider™ virtual mouse pad? 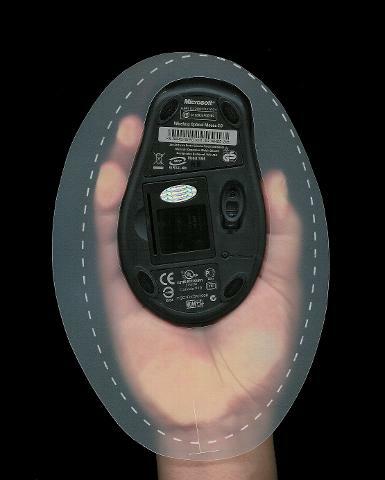 It eliminates the friction caused by the palm and forearm when using a mouse, and it works with ANY mouse! Now your hand and palm glide with your mouse, increasing precision while helping reduce carpal tunnel syndrome, fatigue and eliminating the friction and irritation created by a stationary mouse-pad or work surface. The secret? Click here, it is the palm of your hand, the major cause of friction. In fact, the MouseGlider™ mouse pad may even eliminate the need for a conventional mouse pad, giving gamers, graphic artists, and other power users a virtual mouse pad area limited only by desk space. Try it. You'll be convinced this is a revolutionary ergonomic "must have" mouse pad!